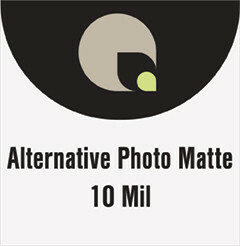 Alternative Photo Matte combines the high resolution of a photo paper with the economy and quick drying time of a bond paper. This "cross platform" paper accepts dye and pigment inks and hot or cold laminates. Main uses include indoor signage, posters, POP sales, and other high-traffic advertising. Can accept up to 400% ink loads while maintaining high resolution and fast drying. Backcoat also gives Alternative Photo Matte superior curl resistance. Improved low temperature lamination helps preserve image quality when the image is rolled between uses.